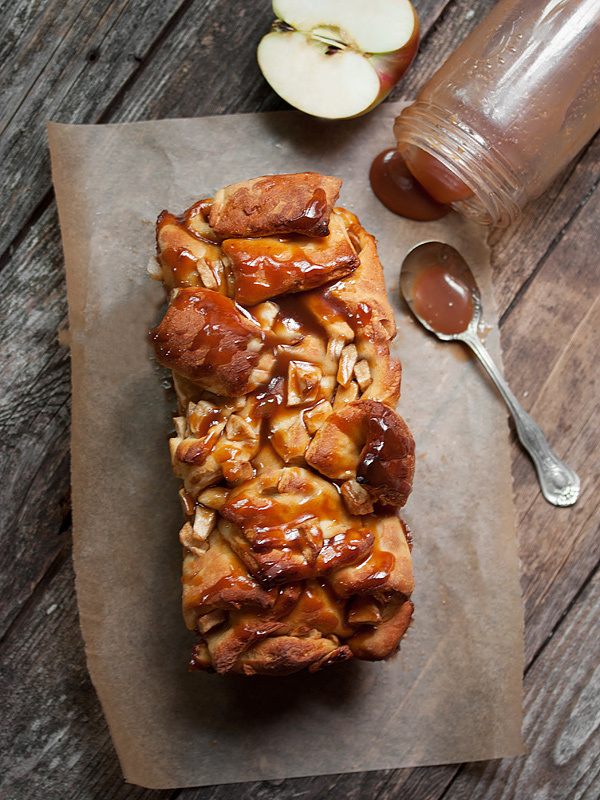 A delicious apple yeast bread, topped with homemade caramel sauce. A great way to celebrate Fall apples! 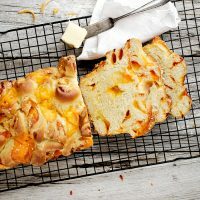 This bread is a spin on one of my favourite apple yeast breads – Bernard Clayton’s Chopped Apple Bread. That bread introduced me to the technique of chopping up the bread dough into little (messy) pieces and dumping it all in a loaf pan. 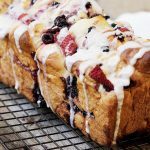 It’s a bit like a monkey bread, but not really, since this is a loaf you can slice after it’s cooked. 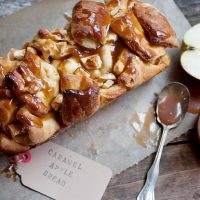 The basic technique to make this bread is to allow the dough to rise, then it is rolled out, scattered with chopped apples and then the caramel sauce is drizzled over top. The dough is packaged up and then cut with a sharp knife into 1-inch pieces. Then you scoop it all up and dump it into a loaf pan. It rises again and then is baked up into ooey gooey goodness. Because the top is uneven, you do have watch it like a hawk to make sure the parts that stick up higher don’t scorch. A piece of tin foil over the top works perfectly, as long as you catch it at the right time. 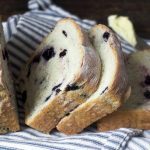 This bread is lovely sliced with a bit of butter, toasted or use it to make French Toast or Bread Pudding for a real treat! Don’t be deceived by how the top of this bread looks. It may look “done” on the top, but the inside needs some time to cook. Make sure you keep the loaf in the oven for around 45 minutes. 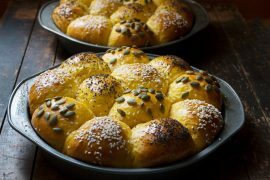 This is a delicious bread that is great buttered and eaten out of hand, or try using some of it as French Toast or in a bread pudding. 2 1/4 tsp instant or active dry yeast (if using active dry, proof in 1/4 cup of warm water and a pinch of sugar and reduce water below to 1 cup), 2 1/4 . For the Caramel Sauce (make a few hours ahead or night before): Making caramel is a bit like a game of chicken. You want to cook the mixture until it gets dark amber, but if you chicken out and pull it off the heat too early, your sauce will be light and lack flavour. Let it cook too long, and it will taste bitter and burnt. Just be sure to watch carefully and have your cream measured and at hand to quickly add to the sauce when the colour is right. To make, combine the sugar, 1/2 cup water and corn syrup in heavy-bottomed, medium sized saucepan. Stir over medium heat until sugar dissolves (mixture becomes clear). Increase the heat and boil, without stirring, until mixture turns a deep amber color, occasionally swirling the pan, about 10 minutes. Remove from heat. Carefully add the cream (you may want to stand back as the mixture will bubble vigorously). Stir sauce over low heat until any caramel bits dissolve and sauce is smooth. Let caramel sauce cool to room temperature or refrigerate in a covered bowl or jar to use later. For the Bread: In a large bowl or the bowl of your stand mixer, combine 3 cups flour with the yeast, salt and dry milk. Add the butter to the water and heat in the microwave or a saucepan until hot. Pour the hot water/butter into the dry ingredients. With strong strokes, beat the batter 100 times by hand, or for 2 minutes with a stand mixer kneading hook. Add a bit more flour, if necessary, to make a dough that can be lifted from the bowl and placed on the work surface. Knead the dough on a lightly floured surface, for 10 minutes or in your mixer until smooth. Place the dough in a greased bowl, cover tightly with plastic wrap, and set aside to double in volume, about 1 hour. 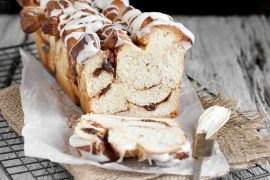 Prepare a 9x5-inch loaf pan by spraying with non-stick spray or rubbing with oil. Cut a piece of parchment paper to fit into the pan to cover the sides and extend a couple of inches on either side (to be able to grab and lift once the bread is done). Set aside. When your bread is risen, but before turning it out, peel, core and chop your apples and set aside. Punch the dough down. Place on a floured work surface. Roll the dough into an 15 inch square, about 1/2 inch thick. Let the dough rest for a few moments. Spread the chopped apples uniformly over the surface of the dough. Drizzle all but about 1/4 cup of your caramel sauce over the apples (If it has been refrigerated, you can spoon over). Fold the dough into a package by folding the top half down to the centre and then folding the bottom half to meet the other half in the centre. Then take the left edge and fold it into the middle and repeat with the right side. This will be the last time there will be a semblance of order in preparing the bread. Using a dough scraper or large knife, chop the dough with random blows into pieces about 1" in size. Uniformity is of no great consequence. When the apple dough has been well chopped, toss or scoop the pieces into the prepared loaf pan, no more than two-thirds full. (Don't fill pan any more than 2/3 full. If you have extra, you can use them to make a second smaller loaf). Cover the pans with plastic wrap that has been sprayed with non-stick spray on the underside and set to rise until it crests the side of the pan, about 40-60 minutes. Preheat oven to 365° Bake about 45 minutes, checking at 25-30 minutes and covering with a piece of tin-foil to stop top from over-browning. Test for done-ness with a cake tester. If it comes out clean and dry, the bread is done. Allow to cool in the pan for about 5 minutes. Run a knife along the end edges and then using the parchment paper, grab the edges of the parchment and gently lift from pan onto a cooling rack. There will probably be some caramel in the bottom of your loaf pan. Pour that over the top of your bread. (If not, you can drizzle some of your left-over caramel sauce on top instead). Peel back the parchment to expose the sides and allow to cool completely. Beautiful and cheesy yeast bread! Delicious and filled with Summer fruit. This bread is delicious toasted with butter! Thanks so much Marla. I’m overdue for making this again. Perfect for this time of year! This is making my mouth water. I love the flavor combination and the presentation is also amazing! Thanks so much, Crystal. Hard to beat the combination of apples and caramel! Do you think one could use the frozen yeast rolls instead of making the dough from scratch? I have some hand issues, and to do the kneading and such would be too much for me. I’ve used them for monkey bread, letting them rise overnight, and it works pretty good. You definitely could, Mari. Just chop the thawed dough, mix with apples and stuff and let rise in the pan. My mouth is watering looking at this bread. Caramel and apple is such a wonderful flavor combo! This looks like an incredible treat! Thanks Laura. 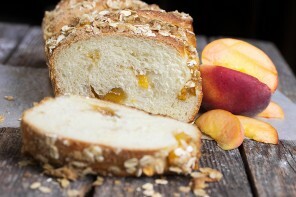 It’s a delicious bread and makes the best French Toast, too. Oh my goodness!!! This looks beyond amazing! Definitely bookmarking it to my “must-tries”. Wowee. Yowza! That looks fantastic! I found you via Huffington Post and am so happy I did. You have a beautiful website! Thanks so much and happy to have found your site, as well! This looks so wholesome and delicious. I’m sure french toast made with this bread would be amazing. Thanks Sophie, I couldn’t remember the last time I had French Toast, either, but it was so nice and a pleasant change from the savoury breakfast we often enjoy on the weekend. Hope you get a chance to try it. 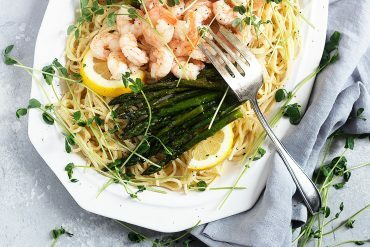 Oh my, this looks amazing Jennifer!! 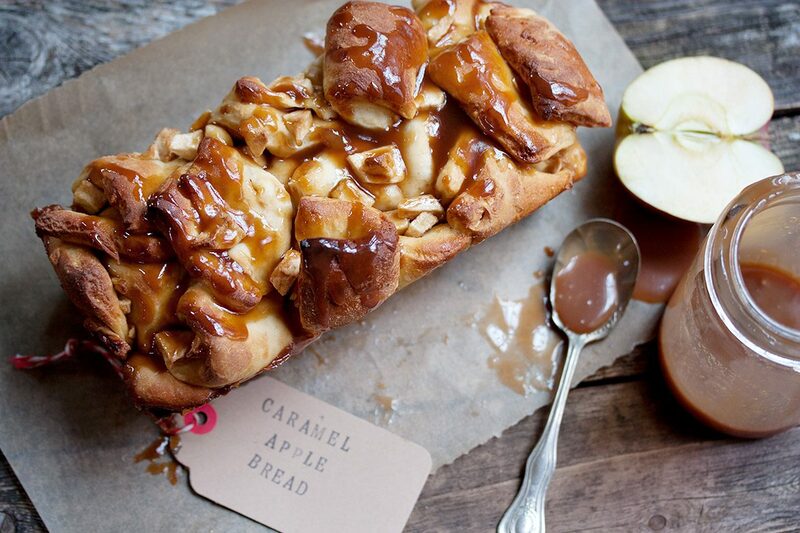 Apple and caramel are always a winning combination in my books! I never make sweet yeasted breads. I definitely have to change that. It was really good, Liz. I used the last few slices to make French Toast on Sunday morning and it was perfect!